The Mariners had a 6-3 lead, but another shaky effort by the bullpen led to a 7-6 defeat in Chicago Thursday, their third loss in a row. James Paxton managed only five innings, giving up 3 runs. Seattle relievers Arquimedes Caminero and Steve Cishek coughed up a 6-3 lead in the seventh, and Nick Vincent surrendered a walk-off single to Todd Frazier in the ninth as the Mariners fell to the Chicago White Sox 7-6 Thursday night at U.S. Cellular Field (box). Frazier entered the seventh 0-for-3 with three whiffs, rapped a two-run single off Cishek to tie at 6, and then hit the game-winner over third base. The Mariners (67-60), losers of three in a row, fell 7.5 games behind AL West leader Texas, a 9-0 winner over Cleveland, and remain three behind Baltimore, a 4-0 loser to Washington, for the second wild card slot. The Mariners took a 2-0 lead in the first on Seth Smith’s RBI double and a DH Nelson Cruz sacrifice fly, recovered from a 3-2 deficit to tie in the fourth on 2B Robinson Cano’s 29th home run, and busted loose for three runs in the sixth, the big blow 1B Adam Lind’s two-run single for a 6-3 advantage. In the seventh trailing 6-3, the White Sox got a run back on Tim Anderson’s ground-rule, run-scoring double off Caminero, who was replaced by Cishek. He gave up a two-run single to Frazier. All of Chicago’s runs in the frame were unearned. Cano went 2-for-4 and collected his 80th RBI. Cano’s was Seattle’s only multi-hit game . . . Cruz’s RBI was his 79th . . . Guillermo Heredia, just up from Tacoma, collected his first major league pinch hit, a single in the seventh . . . SS Ketel Marte (0-for-3) had his six-game hitting streak snapped . . . The Mariners, who had seven hits, went 2-for-7 with runners in scoring position and stranded five. Called up from AAA Tacoma earlier Thursday, James Paxton worked five innings, allowing three earned runs on seven hits with five strikeouts and one walk. He departed after throwing 90 pitches, 57 for strikes, but did himself in by throwing 31 pitches in the first inning when Chicago scored twice . . . After Paxton departed, Tom Wilhelmsen worked a perfect sixth. The game was delayed for nine minutes in the ninth when three White Sox fans ran on the field . 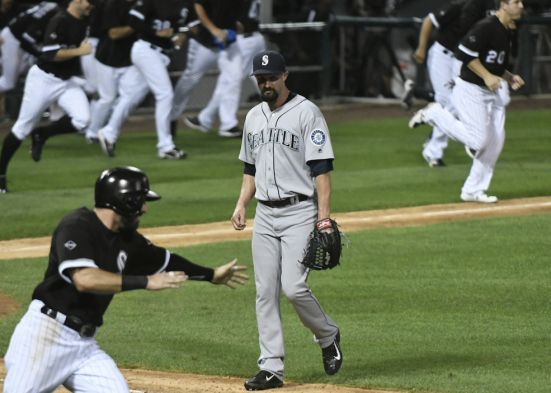 . . Seattle fell to 13-15 vs. the AL Central, to 2-2 vs. the White Sox, and to 31-32 on the road . . . 3B Kyle Seager missed his second consecutive game with a bruised foot. He fouled a ball off of it in Wednesday’s 5-1 loss to the New York Yankees. With Seager shelved, Shawn O’Malley received another start at third. The second in the series’ four games is Friday at 5:10 p.m. PT. RHP Felix Hernandez (8-4, 3.26) will pitch for Seattle opposite LHP Chris Sale (15-6, 3.15). After the series concludes Sunday, the Mariners will play three games at AL West leader Texas.